Again, life is moving too fast, too full, to write more than a tiny piece of what I am experiencing here in Israel and Palestine. 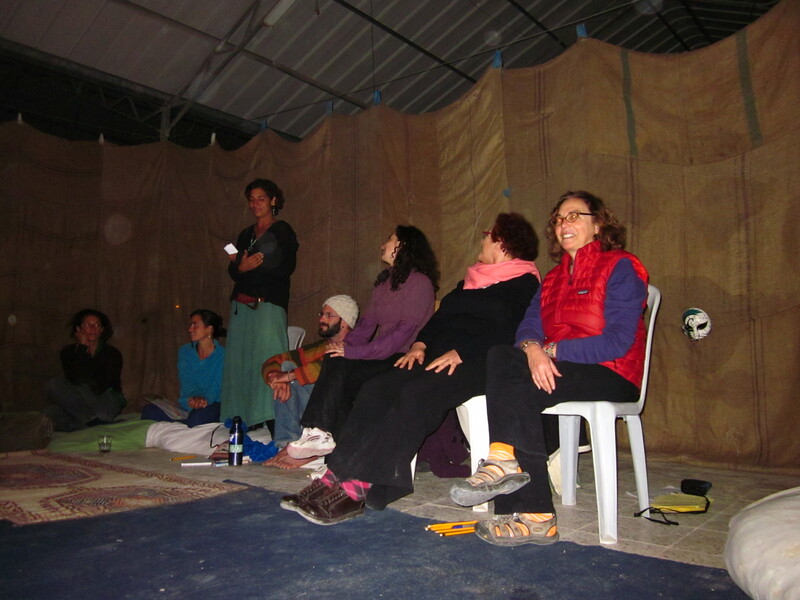 This past weekend 60 or so of us – Palestinians, Israelis, American and European Jews, internationals- lived and practiced Nonviolent Communication together in an eco camp near the Dead Sea in the West Bank. This is a report about the retreat. 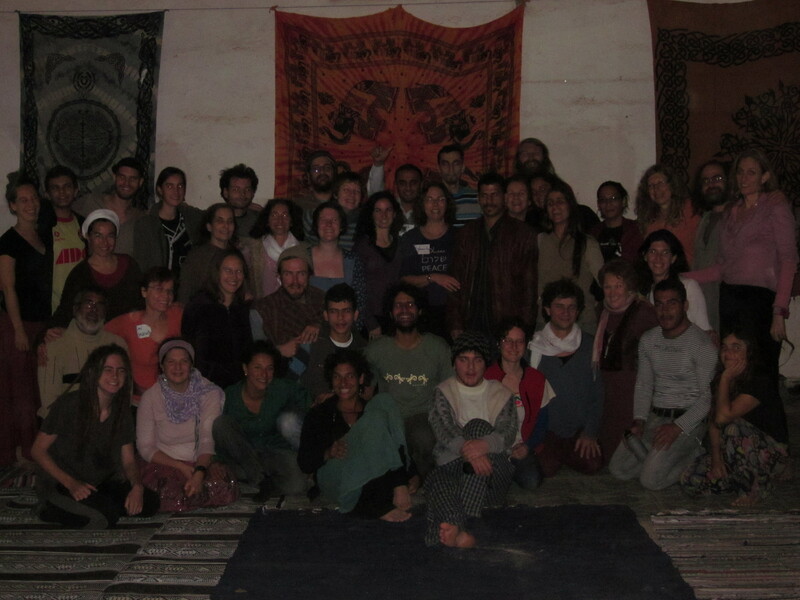 First, I offer a deep bow of gratitude to friends from the US who supported this retreat. The event was such an amazing success that we are having a second one in March and there already are many requests from all over Palestine and Israel for follow up trainings. Numbers of people said they wanted an in depth training in NVC so they can bring NVC to their organizations, communities and work. My dream now is to support the creation of an NVC training Institute at EcoME in the West Bank ( a new residential community that is embracing NVC in its functioning, in a beautiful desert location accessible to Palestinians and Israelis without permits) to train the numbers of leaders, especially from the younger generation, who came from all over Israel and Palestine to learn and train in NVC. 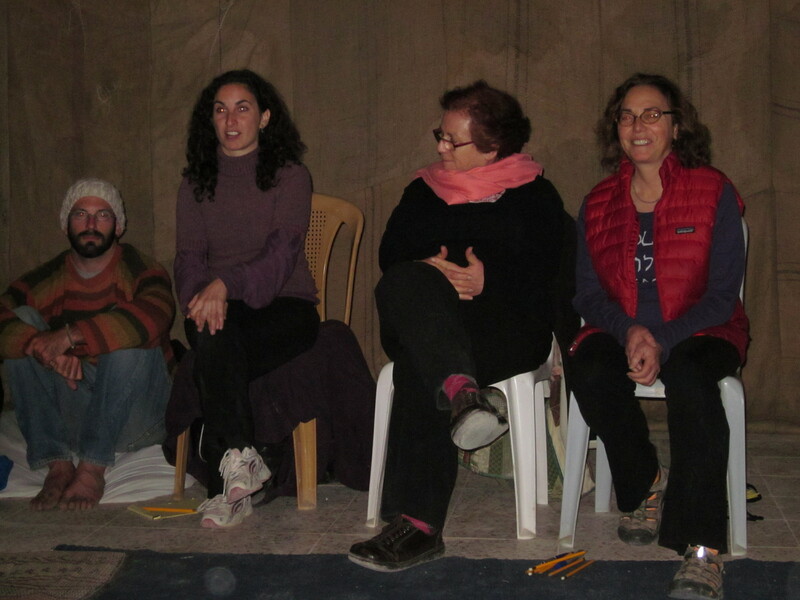 I also offer a deep bow of gratitude to Hagit and Hillia, seasoned Israeli NVC trainers, who said yes when I asked them to join the facilitation team, and who said yes to partnership every step of the way. We took turns facilitating in the whole group, then broke into smaller groups for skills building on Friday and topics on Saturday. The topics were Creating Dialogue between Palestinians and Israelis with NVC; Using NVC with Family, Friends and Colleagues; and Using NVC in our Social Activist and Peace Work. 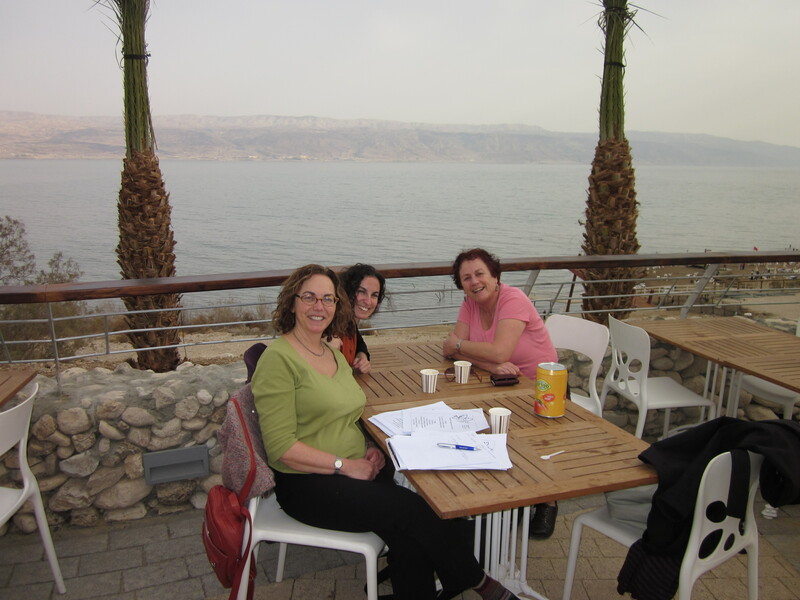 Me, Hagit and Hillia planning the retreat- we are a mile from the Eco ME Center where the retreat was held, and, yes, that’s the Dead Sea in the background. I offer another deep bow of gratitude to the Eco ME staff and supporters who, in six weeks, have created this oasis of beauty, peace, connection, safety and learning. 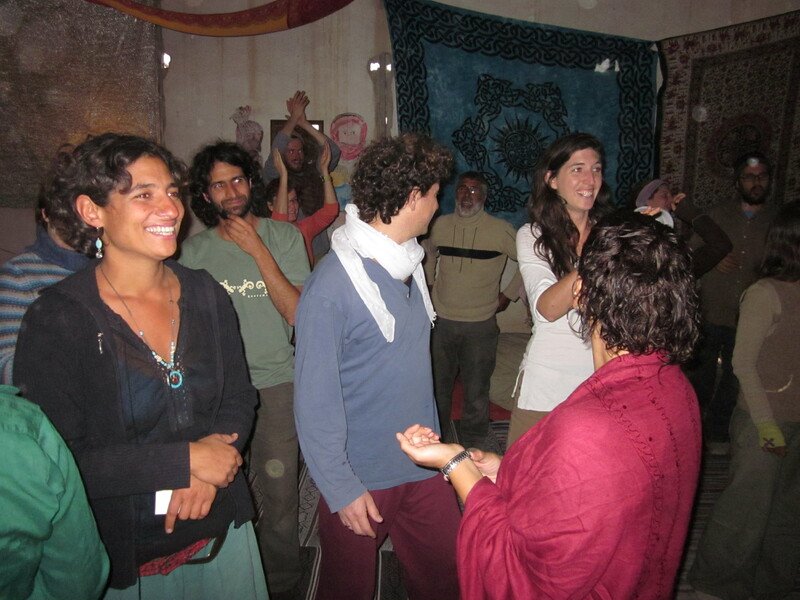 This event was the first retreat they hosted; it is the fulfillment of their dream to create a center in the desert where Israelis, Palestinians and internationals feel so at home that they can do deep peace work. 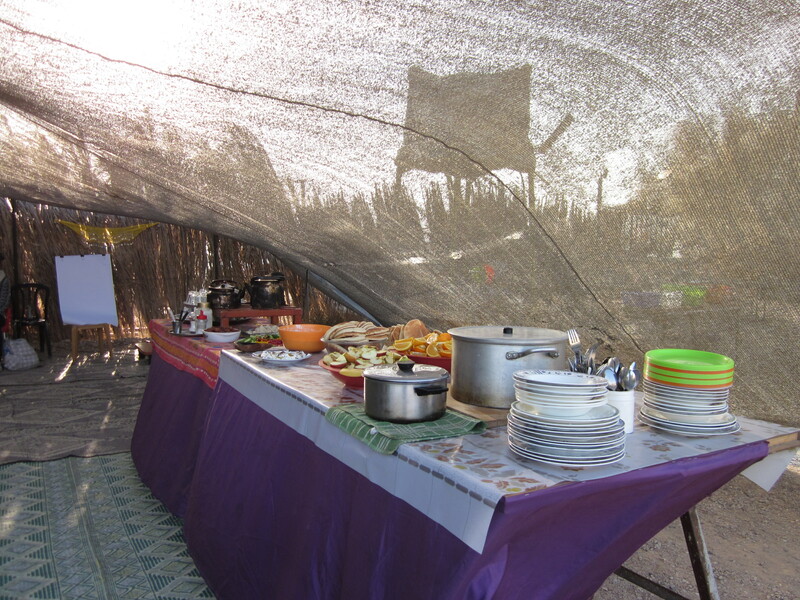 …and the beautiful accommodations they set up for our participants. 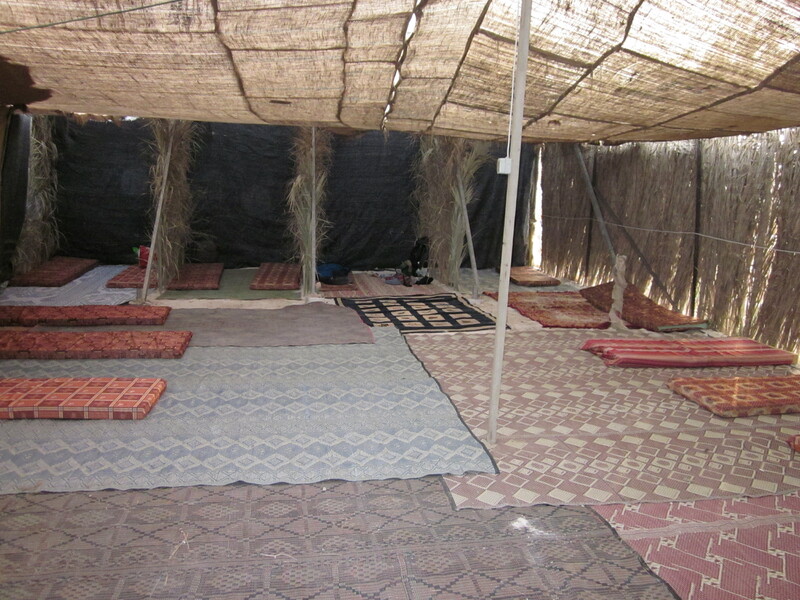 These are Bedouin style tents. 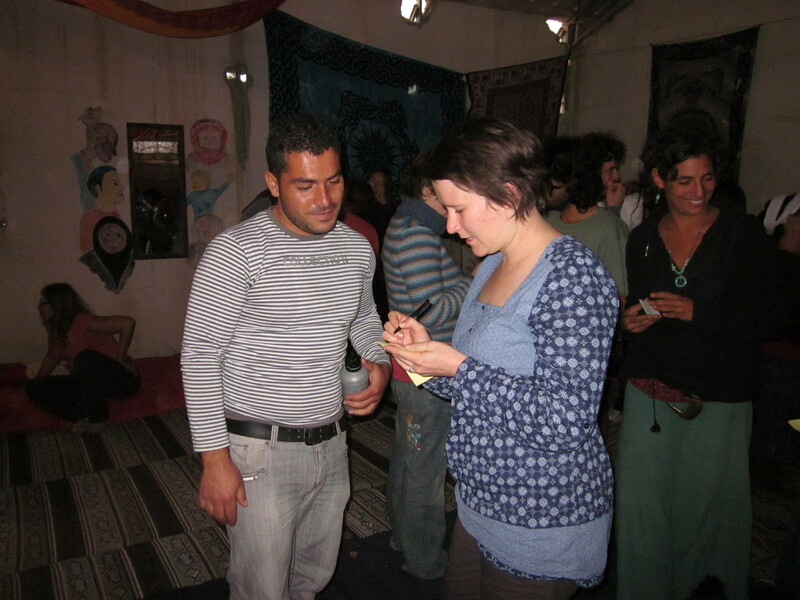 A deep bow of gratitude to our Arabic language translators. Their generosity and willingness to step forward again and again inspires me personally to build relationships with people across divides and also made it possible for all of us to learn from and connect with each other, to include everyone who came for the retreat. Hanan, reminding me in every moment that sisterhood is powerful. 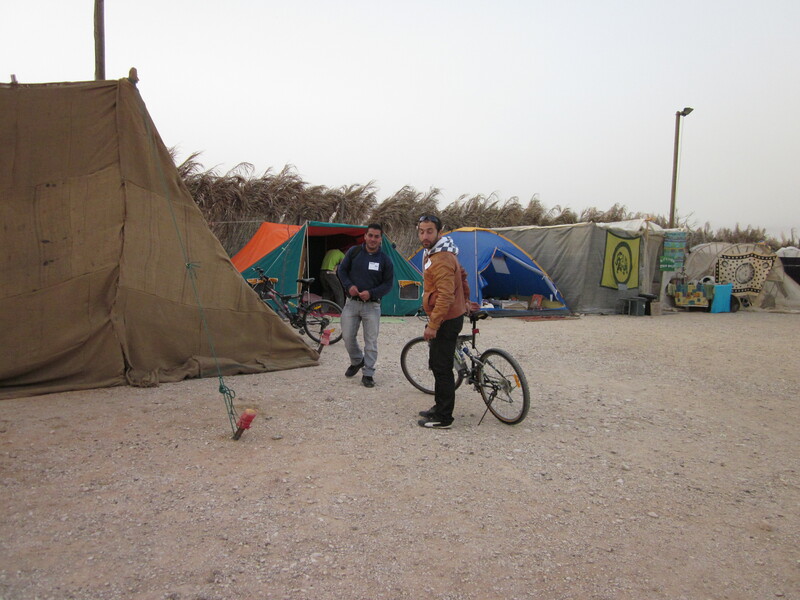 The first people to arrival at the retreat- two men on bicycles from Jericho! I was so delighted that the first guests to arrive at this EcoCenter traveled on bicycles. They came from Ramallah, where they took the bus to Jericho; then borrowed their cousins’ bicycles from Jericho. Toward the beginning of the opening session I heard the need for trust raised by Palestinian participants who said they did not want their photos taken. I spoke about the dream the retreat organizers held of creating a community where trust was so deep that people would feel ease speaking with honesty about difficult issues. I then proposed a strategy to create trust that we generally use in the US- creating a confidentiality agreement. As I explained what the confidentiality agreement might look like, I noticed several westerners in the audience nodding their heads in agreement. Then I heard a big “no” from several Palestinian participants. Trust, they asked? We don’t know who is here. What kind of trust are you talking about- we don’t know who is even here in the room. 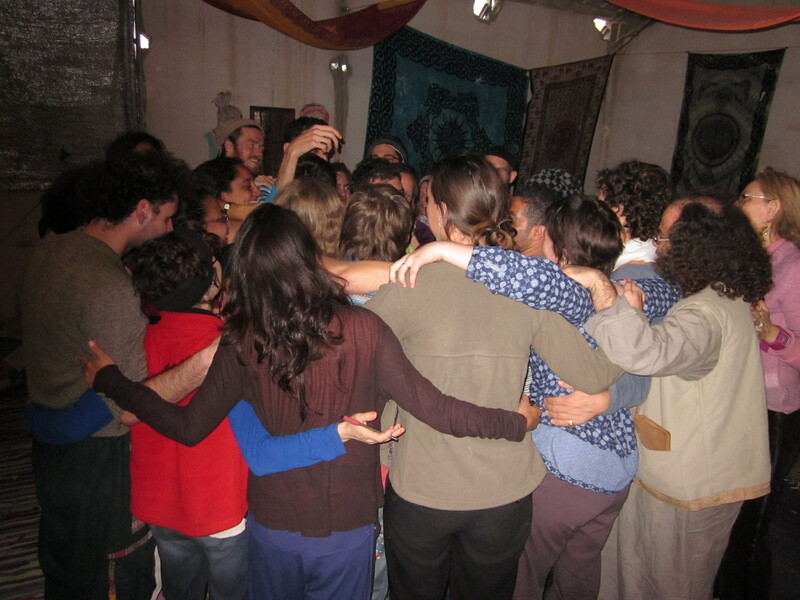 Once again I saw the complexity of doing this work here- the work of creating a joint community of Palestinians and Israelis to do deep, honest transformative work together. It’s not just about the people inside the room keeping what we hear confidential when we leave the retreat; it’s about creating a sense of trust inside the room. Over and over, through the weekend, people asked, how do we do that? Can we do that? Can we imagine doing that? I love rolling up my sleeves in workshops to explore together how we can create the sense of home and trust How can we transform the idea of “trust” from an abstract concept, something that is out there in the ozone, eons away from our grasp, to something experienced right here, in our midst? 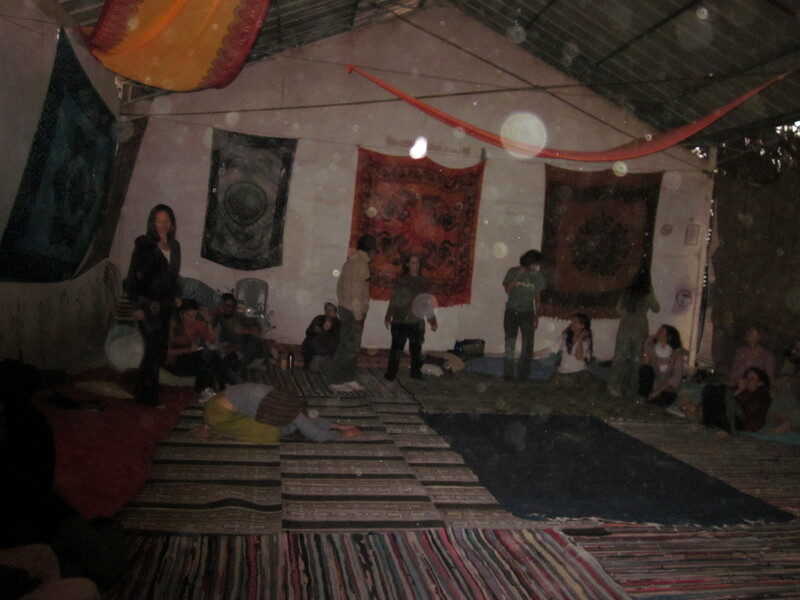 This is the great experiment of these NVC retreats. Can we create community that values and ultimately meets everyone’s needs? That is how we open the channels of trust. In this workshop, how can NVC help us all create the trust and connection that is needed to feel at home? Certainly not the strategy I suggested, when the trust that needed to be built was trust in the room, in the community that gathered from all corners of Israel and Palestine, for this weekend experiment. This is a story of how trust was built. by living and practicing NVC together. Here are some examples of how this happened. At the beginning of the workshop, several people asked if they could take photos and videos. We asked who would not want their pictures taken. 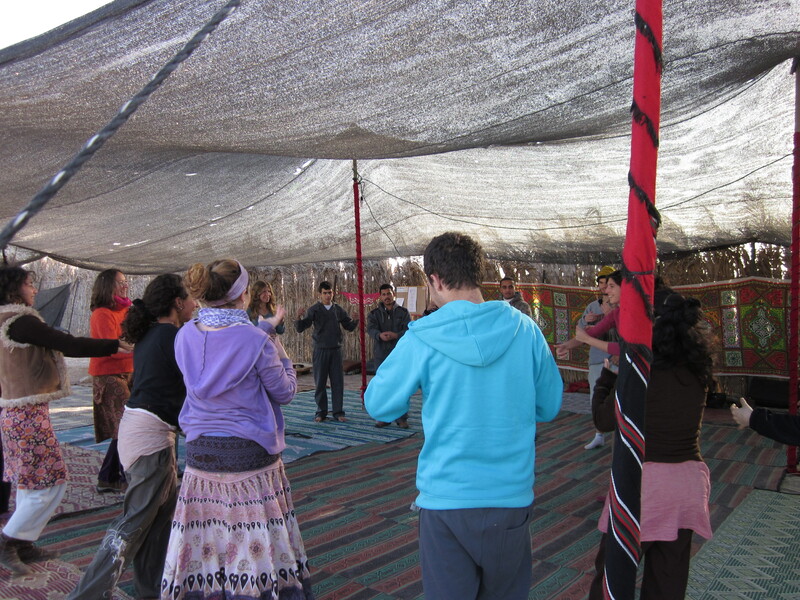 My recollection is that only Palestinian participants raised their hands. We began the discussion about creating trust. This became a theme throughout the day. Just two days later, at the end of the closing circle, people began dancing and jumping together (I hope to get the video of this on to this blog) – the man who had spoken the most about why the confidentiality agreement I proposed or photos didn’t work for him came dancing up to me smiling and shouting, take my photo, take my photo! In the workshop session on bringing NVC into our families, people from different continents and cultures shared our insights about the obstacles in our own cultures to embracing one’s own needs, to creating peace inside of ourselves;; in circles, we shared our insights about our own inner lives and about our spiritual paths, and how we can practice them in a way that creates an inner war, a war that NVC extinguishes by offering the practice of self empathy, understanding the needs behind all of our actions. At the closing circle, Palestinians shared how they have dreamt of seeing the human face on Israeli soldiers; how they never thought it would be possible. Here at the retreat, they met a soldier, as a person, as an equal. The notion of enemy begins to melt. Several times during the retreat I heard Palestinians say that they had never met Israelis, never imagined living with them, feeling safe together. That this experience of living together and talking honestly together gave them hope they never thought possible. 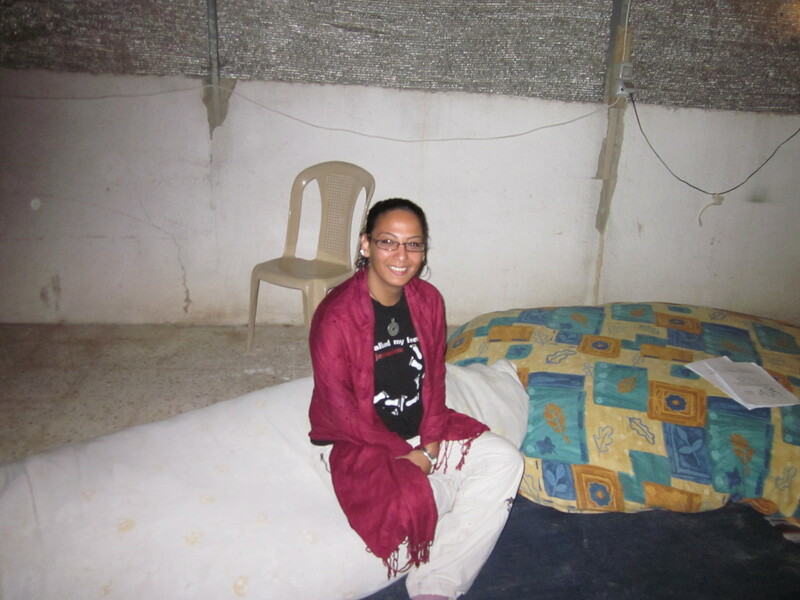 Around the campfire at night, playing the game of Truth or Song, an Israeli woman explained to a Palestinian man how she believes the Occupation hurts her, hurts Israelis-because she has to live as if she doesn’t see. 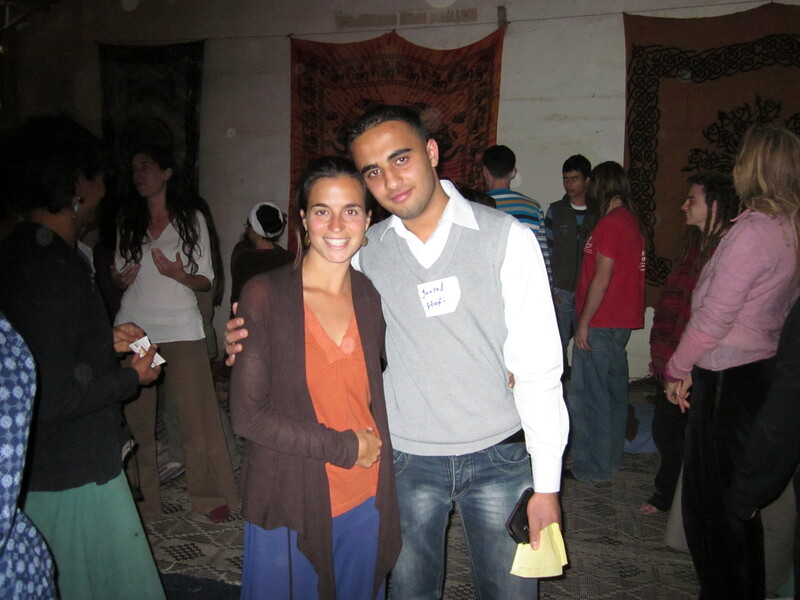 I saw numbers of Israelis and Palestinian exchanging addresses and making plans to get together in the next few weeks. And, yes, when I got home, the face book friend requests were already pouring in from both sides of the Wall. When I reflect on all this, I feel moved, hopeful- this is nonviolent resistance to the Separation Wall- there is a Wall; it appears to be meeting some needs, particularly of Israelis. The cost is high. One cost is a growing separation between Israelis and Palestinians which leads to less and less understanding of each other, less trust, less and less hope for empowering grassroots joint peace efforts. When we get together with each other, when we cross the borders and establish real relationships with each other, there is no wall between us, in our individual encounters. We resist allowing the physical wall to define our relationships. NVC and political action- We witnessed incredible transformation at the NVC workshop- Palestinians who had never met Israelis before spoke deeply and movingly at the end of the weekend to how seeing the human face, hearing the feelings and needs, living together and being able toe express fear honestly, brought them to a place of love for the Israeli soldier, the rabbis and rabbinical students, the many other Israelis who they met at the retreat. In this I see the longing of the human heart to connect with life, to experience trust and community. On a very significant level, for me, just to be in a community and a practice that brings this degree of trust and transformation into the world is enough. The joy of witnessing, of supporting this connection between people, fulfills deep needs in me for hope, contribution, meaning, and peace. And I also want to explore how NVC can contribute more directly, more effectively, to changing the power structures that hold in place the systems that have caused the separation and mistrust and strategies of guns and denial of resources to people. 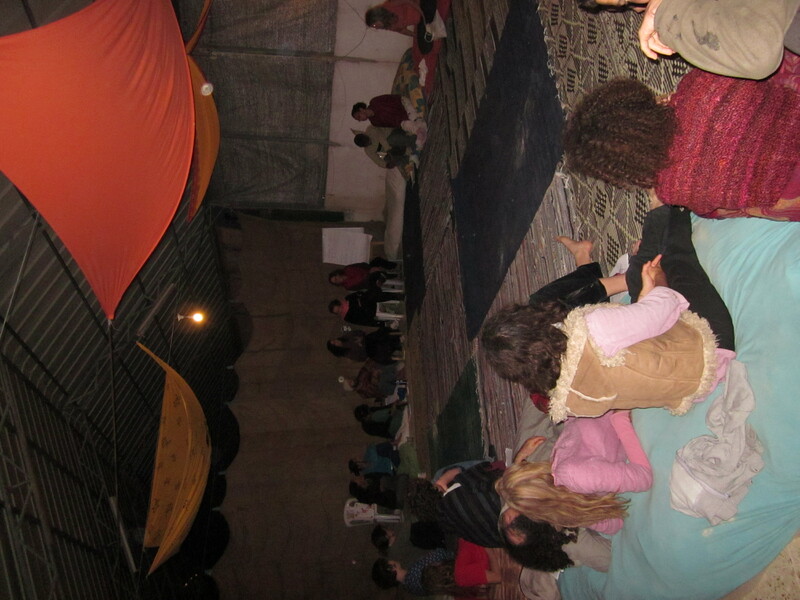 In a session on Bringing NVC into our Social Action and Peace Work, an Israeli woman expressed her fears that NVC is a process that takes so long, that requires the time and patience for multiple back and forth between people, one on one, that she worries that it will never become a significant presence in the “hurry up” culture in the Mid East. I asked a Palestinian participant to reflect back what he heard were her feelings and needs when she said this. He heard that she was concerned that their culture- Palestinian and Israeli- wouldn’t open to NVC because it was so different from the culture. He then shared that he had hope that NVC can make this contribution because he was learning it and it already was making a big difference to him. When I heard him say this, I felt gratified that the workshop was effective in supporting the awareness and change I want to see in the world. And I also wondered, and wonder now, is it really possible to garner the level of resources needed to bring this on the scale that will change structures? The discussion between the two men, who are friends and had arrived together, took place as we were settling in to the session. I asked if they would be willing to hear each others’ needs before they went to strategizing about who would use the plug- I said that who gets to use the plug first was a strategy; lets see what happens if we connect with everyone’s needs first. I suggested a role play between them to see what would happen. One of the men asked that a third Palestinian friend play his role. We did the role play. After each one said why it was important to him to charge his phone, I asked them, and the other participants, to reflect back the needs they heard. After some guessing of the first man’s needs, there was deep connection in the room to how having access to the cell phone was a way of meeting his need for love-staying connected with the woman he hopes to marry. I asked if anyone noticed a sensation in their hearts when they understood the man’s need for love. One person pointed to his heart and said, “Softer”; nods all around. 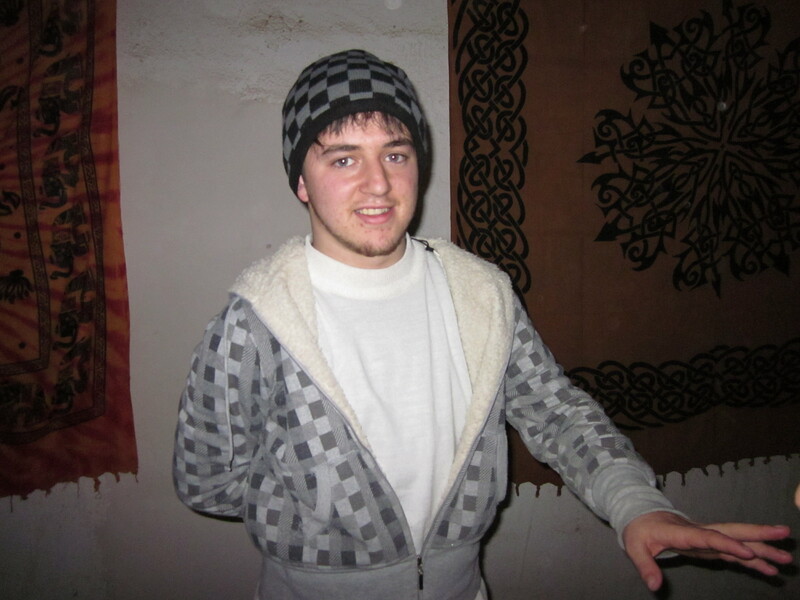 We connected with the other man’s need for respect and consideration to his family, who were worrying about him being far away from home in an unfamiliar environment and that staying in cell phone contact, was the way he could do that. Again, the energy in the room shifted as we all took in the importance to him of respecting and considering his family. Once we all connected with the needs. With connection to what was important to each of them underneath their wanting to charge their phones first, people began to suggest strategies- charge one for an hour, then the other. No, too long for the second one. Charge one for ten minutes then the other. No. Someone heard the “no,” and guessed that there was another need- the need to have his concern, to have what was important to him, really heard and valued by the other person. Yes, yes, he said. He wanted equality. Caring. That broke the stalemate open. How about if the first person called his parents from the phone of the other person and told them that if they needed to reach him, to call on the other person‘s phone? And later, when the charging switched, they would reverse it. This would meet a number of other needs that came up- for community- as way of connecting their families, who were from the same community-and sharing resources. A participant objected, saying, no that won’t work if you don’t know your parent’s number. Someone said, you can take out your sim card and put it in the other phone……..
Every concern, every obstacle, was met with a creative new strategy from the group. We did this work with several other role plays- between colleagues working in the same organization, asking each other do to things that the other said no to. When we stepped back and connected with the needs, the strategizing became fun, not tense, and the solutions were effective and creative. We saw how the more specifically the need was described in the request, the easier it was for the person to hear the need and to recognize the common need in it. And then with a difficult real time issue of people leaving the room to take cell phone calls during the workshop. At one point, an Israeli woman brought up that she was upset because both of the Arabic language translators had left the room to talk on cell phones, so there was no translation for the other Arabic speakers. When we helped her translate her judgments and assumptions into an understanding of her needs, she then presented them to the men when they returned. At first the response was defensive; then we helped them hear the needs, and listened to the needs they were meeting in taking the calls. With the connection to both sets of needs, we again felt the transformation of hard closed energy into softness and understanding. We came up with strategies that addressed the deeper needs of trust and sharing and growing. I left this session feeling deeply moved by witnessing the creativity of solutions that are unleashed when there is a real connection to needs. I feel hopeful that there really are political solutions to the conflict between Israel and Palestine, and that we don’t know the political solutions yet because the connection, the real connection that comes when each side embraces the others needs, that understands and feels the life energy in the needs, hasn’t yet been established. I left with hope that solutions are possible. And also with the question- how can this process work on a large scale, how can it directly affect the power structures? Let us address these questions directly at the next training. Can We Talk to Each Other?